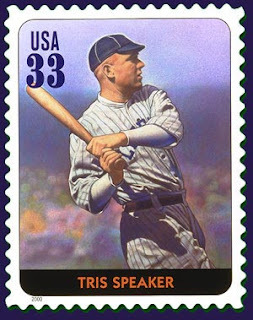 Although he played in the days of baggy flannel knickers, Tris Speaker displayed an elegance playing the game that earned him an early entrance into the Baseball Hall of Fame. "Spoke" also served in the U.S. Navy during World War I prior to becoming one of the most famous baseball players in the "Dead Ball" era. Speaker played a superb center field to go along with his superior offensive skills— playing primarily in an period before the long ball became a big part of the game. Speaker won the AL MVP when he hit .383 and recorded a 1.031 OPS. He also stole 52 bases that season while leading the league with 53 doubles and 10 HRs.